According to Munster, Apple is still early in its augmented reality product road map, though two of the foundations have already been laid. The first phase calls for expanding TrueDepth cameras to more models alongside the premium iPhone X, followed by increased adoption of ARKit apps (that presumably take advantage of the more advanced hardware) in the second phase. Smartglasses make up the third phase of the roadmap. 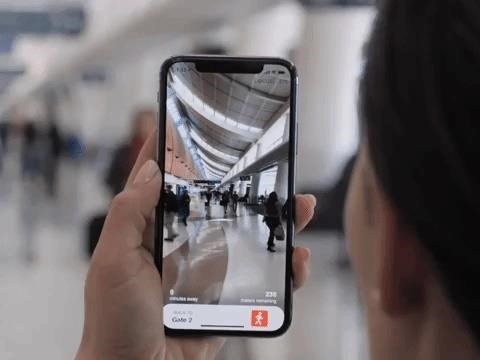 Like the rest of the AR industry, Apple faces several hurdles in reaching that third phase. "This begs the question: are we ready for AR glasses? Not now, but eventually we will be. AR is better hands-free. We're not made to experience the world holding up a tiny window," said Munster. "Our arms and eyes get tired. Glasses solve that problem, but they also create a problem by breaking a social dynamic around privacy. We expect minuscule wearable adoption until the utility of an AR wearable offsets the negative social dynamic. Simultaneously, the technology must advance to a point where the design of the glasses is not a negative factor (as we've seen with smart watches). Once that happens, wearables will likely go mainstream." Looking at the current crop of wearables, Moore's law has a few more cycles before design overcomes that stigma. At present, truly immersive experiences require processing and battery power that do not fit into normal looking or even stylish frames. Those smartglasses that meet aesthetic appeals do so by compromising the AR experience that makes the technology groundbreaking. As the old saying goes, between price, quality, and schedule, you can only have two of the three. Apple has a track record of prioritizing a quality experience at a premium price rather than rushing a product to market. The iPhone is often credited with launching the smartphone category, though it was preceded by Blackberry and a a number of Windows Mobile devices. Similarly, tablets existed before the iPad came along to dominate the category. Samsung and Android-backed OEMs shipped smartwatches first, but the Apple Watch finally made the idea popular. Aside from a few exceptions (cough, Apple Maps, cough), if there's anything one can count on in the technology industry, it is that Apple will take the time to get it right.